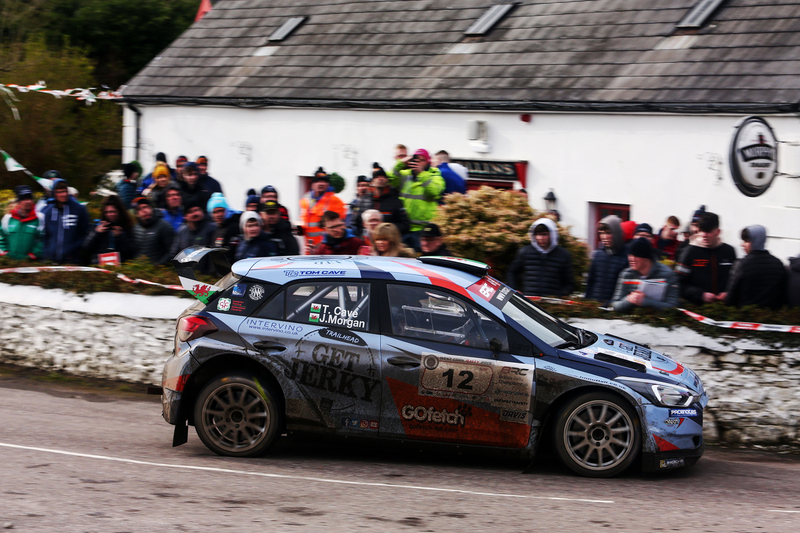 Tom Cave and his co-driver James Morgan won round two of the British Rally Championship on this weekend’s Clonakilty Park Hotel West Cork Rally, the result putting Tom’s chase for the BRC title firmly back on track. 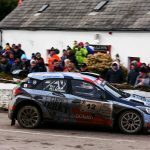 The event also hosted a round of the Irish Tarmac Championship and therefore, the Welsh pair’s third place overall against many of Ireland’s top drivers, underlined the strength of their performance. Proceedings began on Friday evening with a ceremonial start in the centre of Clonakitly, the event’s host town, with the action getting underway on Saturday morning in extremely wet and windy conditions. Right from the word go, Tom from Aberdovey and James from Hirwaun made their intentions clear by setting the third-fastest overall time on the first stage. 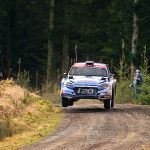 A braking issue on stage two slowed them slightly, but with the Hyundai working well and Michelin tyres providing exceptional grip, another third-fastest time on stage three was followed by a second-fastest time on stage six. These three impressive runs pushed them back up to third overall and more importantly, they were now the first of the BRC crews ahead of the day’s final loop of three stages. 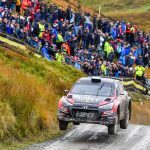 However, the Welshmen’s charge was diluted a little due to a puncture on stage seven, which allowed their arch BRC rivals Matt Edwards/Patrick Walsh to nip past. 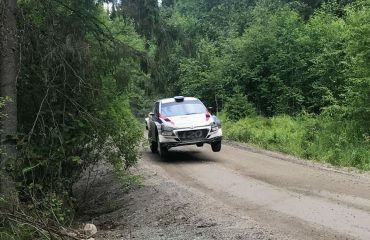 Another third fastest time on stage eight meant Tom and James ended the day fourth overall and second BRC crew, albeit by a slender 6.8 seconds. In contrast to the previous day, Sunday dawned dry and bright and Tom and James focused on the task in hand: to get back ahead of Edwards/Walsh. And on stage 10 – the first of the day – that’s exactly what they did, with a second fastest overall time that elevated them into third place overall and put them 1.2 seconds ahead of their BRC rivals. They were fastest overall through the next stage, beating their rivals by 1.4 seconds and therefore, putting them dead-level to the tenth of a second! But Tom and James were not finished yet and another fastest overall time through stage 14 pushed them ahead by 4.9 seconds. 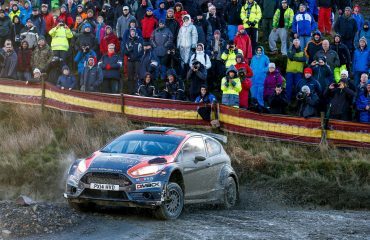 “It feels brilliant to win a round of the British Rally Championship again. We had an intense battle with Matt and Patrick throughout the event and that meant we really had to fight hard to come out on top. 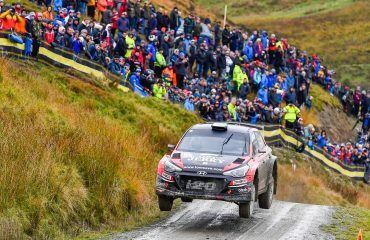 “The first day was very challenging as we were also battling against the elements, but having taken some fastest BRC times I knew the pace was there. We ended Saturday in a good position for Sunday’s stages and on the dry roads I was able to push even harder. The Hyundai felt great and the Michelin tyres were working perfectly, so once we were in front I felt confident we could hang on to the lead. 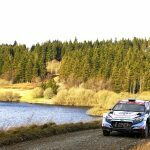 The next event in the British Rally Championship calendar is the Carlisle-based Pirelli Rally, which takes place on 27th April and sees the surface change back to gravel, as competitors take on the notoriously demanding high-speed stages in Kielder Forest. 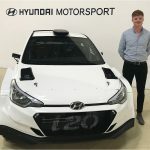 Tom’s 2019 British Rally Championship campaign is supported by: Trailhead Fine Foods and their Get Jerky snack brand, Cambrian Training, Michelin Motorsport, H.N. Nuttall Foodservice, Go Fetch Ltd, Intervino, Castell Howell, Atech Racing, Walero and Hyundai Motorsport Customer Racing.